Happy hump day! (That sounds soo bad LOL). I just wanted to quickly share this card I made for a friend. The card measures 4 1/4x5 1/2. The image is from The Greeting Farm Cheeky Nurse. She is so cute. I added criss cross lines to her stockings to give it a fish net look. I colored her with my Copic markers. I didn't have a sentiment that said "Get Well" that would fit, so I went with "Thinking of You". The banner is from QuicKutz Tattoo Art and was popped up with foam squares as well as the image. The frames were cut using Spellbinders Labels Four. The edges of the designer papers were inked with black. I loved how she turned out. I currently do not have a mastered coloring technique for blonde hair but practice makes perfect. Okay that's it for now, just a real quickie =) Supplies will be listed below. Hope everyone is having a great week so far! Happy weekend everyone! Lindy's Stamp Gang is hosting a YouTube contest. The rules will be listed at the end of this post. First I wanted to share this easel card that I created to help get you going with the theme "Under the Sea". 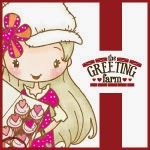 I fell in love with The Greeting Farm Syren stamp. I thought she would be perfect to grace the front of my card. The image was colored in with my Copic markers (E00, E11, B0000, B14, BG05, V09, V12, V15, C1, 100). I matted a piece of designer paper with brown cardstock for the greeting/message to be written on. The Lindy's Stamp Gang products I used on this card were the Magicals & Micas. 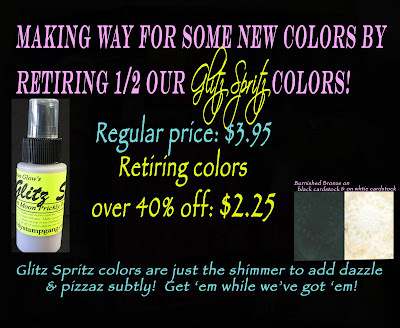 These are perfect for coloring images or giving that extra sparkle and shimmer. The Magicals are vibrant in color and have a paint like quality to them. The powders already have a built in fixative so there is no need to add any, use dry or wet with a waterbrush. On the image I used the mica in Indian Summer Turquoise and the Magicals in Hydrangea Blue on her fin, as well as her eyeshadow on her lids. I then added little dots of the Magicals to her tail. Lots of pearls and rhinestones were added to mimic gems. I put a cluster on her hair as if it was a hair broach and also some on her fin. All the papers that were used were lightly inked with Distress Ink Antique Linen for that aged look. The scroll was cut from the QuicKutz Parchment Scroll die. The sentiment on the scroll came from a Tim Holtz Boundless Flight stamp set. 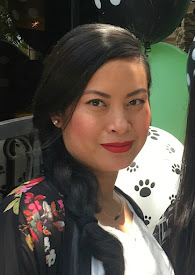 You can watch a video tutorial on how I achieved that shimmery look using the Magicals and a VersaMark stamp pad here. All the flowers on the card were white to begin with and then I painted them using the Magicals in Hydrangea Blue and Witch's Potion Purple. The branches w/leaves were colored with the Magicals in Freaky Franken Lime to mimic seaweed at the bottom of the ocean. The original color of that cardstock was a light kraft beige. The die that I used to cut those branches is the Sizzix Sizzlit Branches w/Leaves die. I added some trim to the bottom of the card as well as the inside. I also laid some burlap in the background for "netting". I hope that those who have a YouTube account will come and participate in our contest. There will be prizes and lots of amazing projects. Even if you do not participate I invite you guys to still come to the Lindy's Stamp Gang channel to view all the wonderful submissions. Thanks for stopping by! • This particular contest is a YouTube only event. 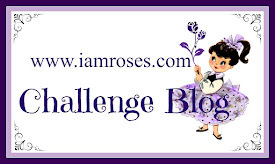 LSG will continue to host a variety of contests in the future, which will include blog hops, etc. • Entry requirements: 1.) Use Lindy Stamp Gang product(s) and 2.) project must follow the theme "Under the Sea." 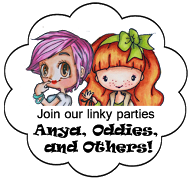 From there, you can create anything from a card, tag, mini album, altered canvas or box, etc! Post a video of your project submission to your personal channel with title: Lindy Stamp Gang “Under the Sea” Contest; Submit a video response to LSG Contest Video to enter; Multiple submissions per person are allowed, but you must do a video response for each submission. • Winners will be announced on the LSG Channel on June 9, 2011. The TOP 5 winners will receive a "Pirate's Bootie" of goodies from LSG. We are looking for creativity and the most inspiring use of colors in your projects! In Addition!!! During the contest (May 21 to June 8) Lindy Stamp Gang will donate 5% of each sale on the Lindy Stamp Gang website to the American Cancer Society. How awesome is that?! 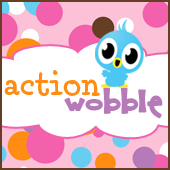 Random prizes will also be given out during the contest, and participants could win little goodies along the way! So don't miss out on the fun! My 2nd anniversary to my handsome hubby is this month, so this is the card I created for him. The size of the card is 6x6. The couple's image is from C.C. Designs Sugar Plums Spring Couple Digi. I colored it in with my Copic markers (E50, E51, E00, E11, E93, W1, W3, E25, E99, V09, V15, 100). The doily layered underneath the image was cut from a Spellbinders Floral Doily Motifs die set. A Spellbinders Fancy Tags die was used to cut the tag. The "Together" sentiment was embossed with white embossing powder. The I Am Roses flowers I decided to use were the Big White Gardenias, Tan Gardenias, and the White Paper Flowers. The white flower was sprayed with Lindy's Stamp Gang Starburst Witch's Potion Purple. It took the vibrant color very well. The skeleton leaves layered with the small green leaves completes the look. Thanks for stopping by. For a more detailed description of this card, please watch the video here. I was in need of a birthday card and this is what I came up with. I just am in love with cupcakes. The "happy happy" sentinment is from the stamp set Hampton Art Happy Birthday (to you). The image of the cupcake, as well as the greeting inside is from Hero Arts Happy Birthday Cupcakes. The two hearts were colored with a red Copic marker. The paper I used was Basic Grey Nook and Pantry. For some interest I paper pierced the edge of the inner square. The one piece of brown polka dot cardstock is from my paper stash. I wrapped a piece of vellum around the designer paper prior to adhering it to the card base. Some faux stitching was added with a brown Sharpie marker. I was going to paper piece the cupcake image but decided to color it in with my Copic markers (Y13, Y17, E25, E44, E27, YG03, YG93). I put the image on pop dots to give it some dimension. So that's my card for today, thanks for stopping by! Happy Friday everyone! There is an exciting contest going on now on YouTube. Visit the I Am Roses Channel to get all the details. You will have a chance to win some amazing flowers from I Am Roses. The contest will be running from May 13th - May 31st, so get on over there and enter for a chance to win. But first, I am bringing you my first creation as a member of the I Am Roses Design Team. Spring is here, Summer is just around the corner and what comes to mind are parties. I created these place settings for that perfect garden party outside. I have incorporated some mini "weights" inside. You don't have to worry about them flying away =) If you have tons of scrap papers and trims laying around (which we all do), you will be able to produce these in a jiffy. For a step by step tutorial on how I made these place settings, please visit my YouTube Channel: Paperdrama or watch the video below. Thanks for stopping by! Sad to see these colors go but I can't wait to see all the new colors! Get them while supplies last at Lindy's Stamp Gang. I'm so excited to announce that I have joined the I Am Roses Design Team! I am joining a group of talented ladies. If you haven't checked out IAmRoses please do. Bunma (the owner) sells the best mulberry papers out there. 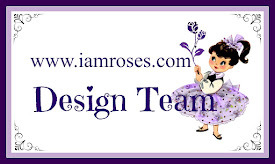 If you are on YouTube, please subscribe to the Design Team's Channel: iamrosesdt . All of the DT members will be posting their fabulous creations using these beautifully crafted flowers. I made this box for a swap that I joined on Facebook, hosted by Jade (JadedStudios on YouTube). I hade so much fun creating this for my partner. The beautiful paper that I used was K & Company Celeste Designer Paper. The theme for this swap was shabby chic. I also made a coordinating card.